We were called to rescue another privately-owned wild cat that had been found during an unrelated police seizure. The 10-month-old bobcat, originally named Lynxie, made headlines across the country. But what the news didn’t focus on is the story behind the story. The one that fuels the captive wildlife crisis – the breeder. 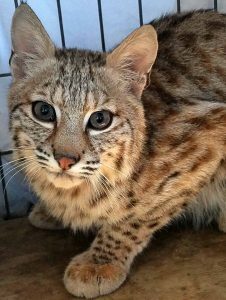 This bobcat kitten was advertised in an obscure ad in Craigslist and sold to the owner on the side of the highway for a hefty price. It’s common practice in the buying, breeding and trafficking of illegal wildlife. The purchaser often loses custody of the animal, but the breeder is not prosecuted and continues selling wild animals as a commodity for profit. It has to stop. This little kitten has already been through so much. We felt he deserved a strong name, so we’ve renamed him Mondovi. He arrived happy and healthy – signs that he was well cared for. We feel blessed to provide him a forever home where he will know dignity, compassion and companionship of his own kind. Mondovi has quickly warmed up to his caretakers. He is a brave little boy who is enjoying playing in the snow, climbing his platforms and curling up with his stuffed toy. 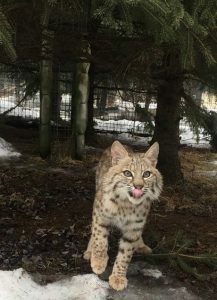 He currently is in quarantine, but will be moved out to a free-roaming habitat and hopefully merge with other bobcats, creating his own family at The Wildcat Sanctuary. You can sponsor Mondovi here!